Party Bus offers more than just party buses – we also operate coaches. You can also choose from our huge capacity double decker coach which has seating for up to 75 passengers along with luggage capacity. Or choose the comfort and safety of our single level coach with toilet and individual passenger seat belts. Our expertise and knowledge is in transporting people in safety and comfort. No job is too small or too big. We can assist you with groups of twenty up to thousands! Each of our Coaches have an onboard sound system. Helps to set the mood of your hire. The best thing about our coaches are the comfy coach seating. Making sure that those longer trips are more enjoyable. 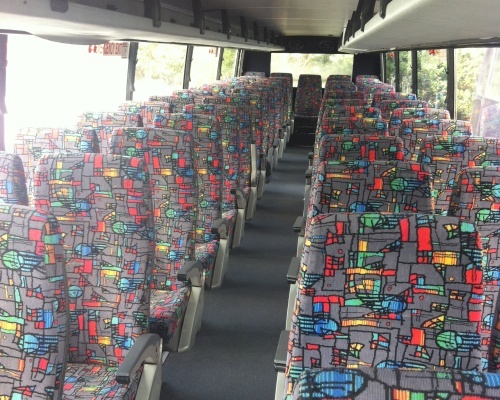 You have a choice of our 46 seat single coaches or our huge 75 seat double decker coach. Our coaches have onboard microphone so that you or your driver can get the message across. * Pricing is valid for pickups & drop offs within 20kms from Auckland CBD, a final drop off before 1am & subject to availability at the time of confirmation. Please note that if you are making a booking on a peak date including the weekends leading up to Christmas or dates that major events are on in Auckland our pricing above will exclude GST. Your price will be confirmed in writing at time of enquiry. We can easily help you with a hire outside these times and areas, however we will need to quote pricing prior to confirming your booking.